Baan Chang is the most expansive and exclusive of the six stunning villas that make up the Dhevatara Cove Estate on Koh Samui’s secluded eastern shore. Despite an atmosphere of royal antiquity, Baan Chang is also a very modern holiday villa, fitted with the latest home technology and furnished throughout with unique pieces like the impressive, circular dark wood table in the dining room and the huge sofa-daybed in the lounge poised in front of an LED Smart TV. All the spacious ensuite bedrooms open onto meditative ocean or garden views and also boast indulgent bathtubs for the ultimate private soak. With tall French windows in every room sliding open to welcome in the soothing views and peaceful island surroundings, Baan Chang blurs the borders when it comes to in- and outdoor pleasure. The villa’s huge private pool offers a constant, easily enjoyed opportunity to cool off, with plenty of cushioned sun loungers to use for relaxing days on the sun terrace or reclining in comfort on the beach. 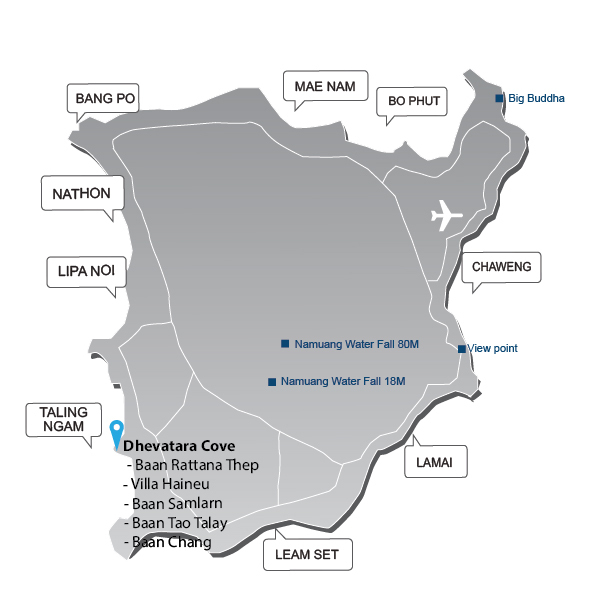 Baan Chang is the first but least visible of the villas when you enter the Dhevatara Cove Estate; its grounds follow the side of a forested headland that forms the tip of picturesque Lipa Noi bay. The villa occupies the largest of six oceanside plots, and the luxurious living spaces and bedrooms are spread through a series of spacious stand-alone pavillions that sit either side of an open-air central courtyard and 20-metre private swimming pool. Baan Chang’s kitchen, dining room and lounge occupy two pavillions on the right-hand side of the property, each sliding open fully onto the poolside terrace. A fully fitted western kitchen is positioned close to the entrance and features a breakfast bar for casual morning gatherings. From there, a corridor leads directly through to the ten-seater dining room, then there’s a small internal garden in front of the comfortably furnished lounge pavilion, which opens out at one end onto a beachside terrace, itself furnished with day-beds. Even guests with royal blood would most likely feel right at home at Baan Chang. The exceptional beachside location, sumptuous furnishings, verdant surroundings and carefully selected art and artefacts all combine to create a sense of special privilege that’s a rare pleasure, even on a boutique island like Koh Samui. Living the outdoor life is an unobstructed pleasure at Baan Chang. The beach is so close and private that it feels like part of the grounds, and the waves provide a constant, gentle soundtrack to the stay. The cool pool is an irresistible centrepiece with its privacy you won’t quickly forget. Guests at Baan Chang also have the unique opportunity to charter one, or both, of the owner’s luxury vessels at special rates to explore the azure waters and teaming coral reefs of the Thai Gulf in consummate style. MY Absolutely (50ft) accommodates 2 crew and 12 passengers, while MY Escape 1 (31ft) accommodates 2 crew and 8 passengers. Baan Chang is the first and most spacious villa on the luxury Dhevatara Cove Estate, which occupies the southern end of secluded Lipa Noi bay on the unspoilt east coast of Koh Samui. The gently sloping sandy beach and year-round swimmable seas look out over the striking limestone islands of the Angthong Marine Park on the horizon. Although never crowded, Lipa Noi offers visitors a modest selection of resorts and restaurants and the beach is also home to island’s most sophisticated, upscale beach club, Nikki Beach.